Lead is one of the most toxic heavy metals known to man. Most health-seekers today realize that toxins are at the root of many (if not all) diseases and toxic heavy metals are among the worst of toxins. As with any other toxin, a three-pronged approach is best for long-term health management with heavy metals: avoid the toxin, and/or neutralize the toxin once assimilated, and/or eliminate the toxin from the system. Generally, all three prongs come into play when optimally managing toxin exposures – especially for heavy metals like lead. Toxic exposure to lead is one of the oldest known environmental (and work) hazards. There is no amount of lead in the body known to be completely harmless. In other words, lead, in any amount, is always toxic. This is an important distinction since some metals that are toxic at higher levels actually have clearly beneficial effects at lower levels. Such metals (safe, at lower levels) include iron, copper, manganese, zinc, and calcium – all commonly supplemented substances. Lead primarily affects the central nervous system, the liver, the kidneys, and the capacity to synthesize hemoglobin. Generally, lead poisoning is a chronic condition, as the circumstances needed to cause an acute toxicity usually need large occupational exposures. Everybody has a body burden of lead contributing to ongoing increased oxidative stress in affected tissues and organs. In addition, all environment exposures to lead are further aggravated by the fact that lead is not biodegradable and continues to accumulate. In humans, about 90% of lead content is stored in the bone, serving as a source of low-grade chronic release of the lead throughout the body as bone is broken down and re-synthesized over time. Because of its near-ubiquitous environmental presence, being exposed to lead is unavoidable. However, it is important to be aware of its underlying toxicity at any level, and excess exposures need to be identified and removed. In children with nonspecific nervous system problems and difficulty learning, blood lead levels should be tested to make sure that lead toxicity is not an inordinate part of the problem. If your current healthcare provider seems 'uninterested' in helping you - it's time to get another doctor. The less lead you have in your body, the better. As well, the more the lead-related oxidative stress is neutralized and reversed, the better. Generally, the approach to lead toxicity, like many other toxins, is to prevent, neutralize, and mobilize. Very high levels of lead will generally require a properly administered protocol of prescription chelation agents, monitored by a qualified healthcare practitioner, at least at the start. Lesser elevations can be managed in a less urgent fashion. A broad base of antioxidant supplementation, led by vitamins C, E, B1, B6, as well as flavonoids and alpha lipoic acid, not only helps to neutralize the oxidative damage inflicted by lead, it also helps to mobilize and excrete this toxic metal. With as little as 1,000 mg of vitamin C – supplemented daily – you can cause a significant decrease in blood lead levels. In animal studies, vitamin C has also been shown to be effective in removing lead from the central nervous system. 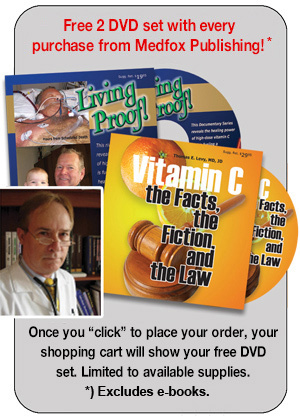 Talk to your healthcare provider (today) and find a vitamin C protocol that works best for you.